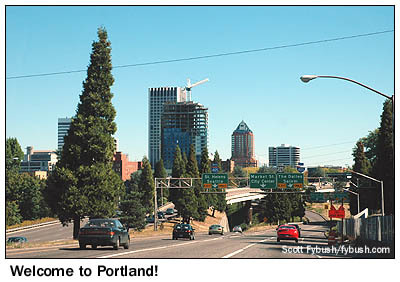 After a relaxing morning drive down the Oregon coast from Astoria to Tillamook, our little group turned inland, heading east on Oregon 6 to US 26, the Sunset Freeway that passes through Portland's western suburbs on its way into downtown Portland. That's the interchange between US 26 and I-405 on the west side of downtown, above, and do make a note of that pointy skyscraper called the "KOIN Center," because we'll get a closer look at it in our next installment. Before we get downtown, though, we make a quick studio stop west of town in an office park in Beaverton (home of Nike, among other cornerstones of Portland's economy) to check out the newish studio building that's home to Meredith's Fox affiliate, KPTV (Channel 12) and its My Network TV outlet, KPDX (Channel 49). 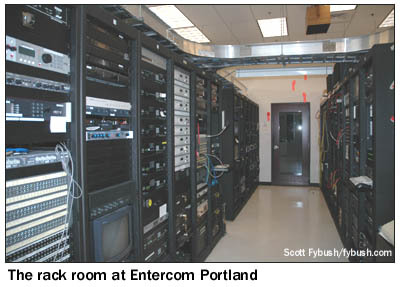 As new as this studio building is (circa 2000), there's lots of history behind this station pairing, and we'll be coming back to it a few times during our extended look at Portland's broadcast scene. 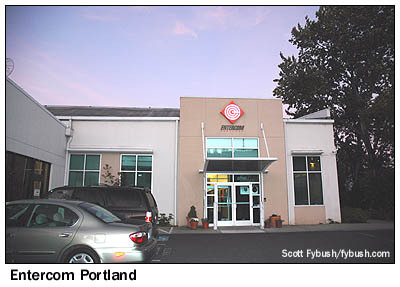 Our destination this warm afternoon is the studio building of Entercom Portland, tucked in between I-5 and the Willamette River south of downtown. We're jumping back in time a bit here, actually - that particular bit of confused driving took place Friday night, when we made our first stop here en route from Eugene to Seaside. 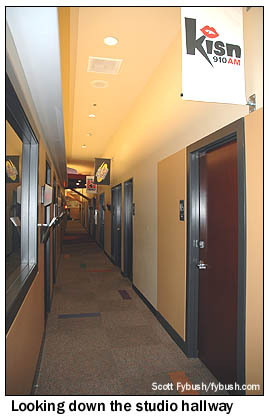 It was then that we had a tour of the studios with Kent Randles, K7YXZ, senior engineer at Entercom Portland. 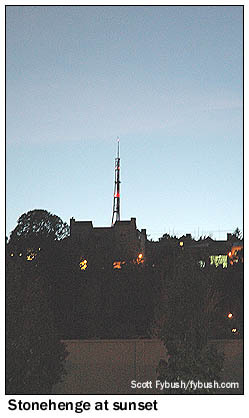 The land where the tower now sits, 1000 feet above sea level, is just shy of being the highest point in Portland city limits, and so this area (Healy Heights-Council Crest) was a natural spot for siting transmitter facilities, especially as FM and TV came on the air in Portland beginning in the forties. 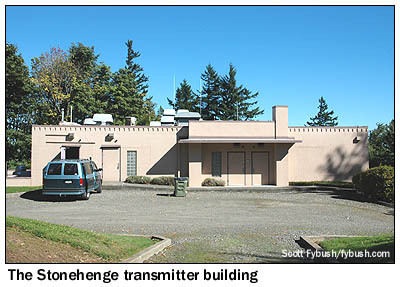 The site where the Stonehenge tower now sits began as the studio and transmitter site of an independent FM station, KPFM (94.9, later 97.1), in 1946. 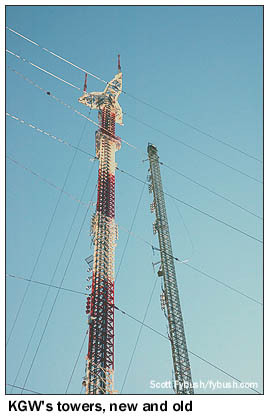 KPFM added an AM station, KPAM (1410) at the site in 1951, and in 1955 a new tower went up on the site for KLOR-TV, channel 12. KLOR became KPTV in 1957 (we'll dissect the whole strange history of channels 27 and 12 next week), and channel 12 moved up to Skyline Drive in 1965. 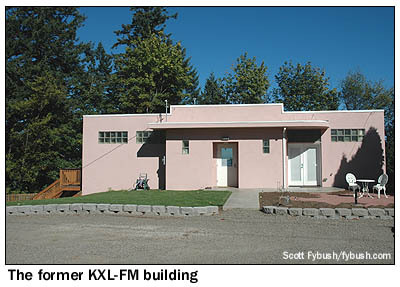 The next lot north of the KPAM/Stonehenge site, at 4636 SW Council Crest Drive, was home to one of Portland's first FM stations, KPRA (99.5). 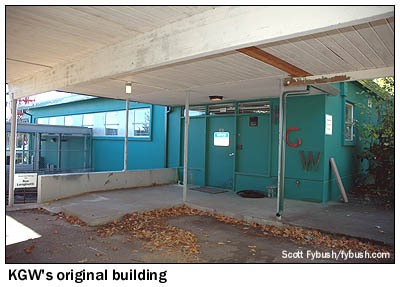 Another site a block away, at 4545 SW Council Crest, was the home of the original KGW-FM (100.3, later sold away from the AM and eventually becoming KQFM and later KKRZ). 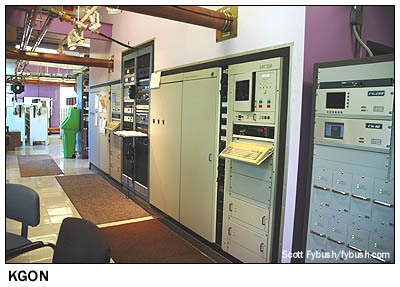 That site was eventually donated to public broadcasting and became the first home of public TV station KOAP-TV (Channel 10) and its FM outlet on 91.5, which started life at 92.3 as KEX-FM on yet another nearby tower over on Carl Drive. 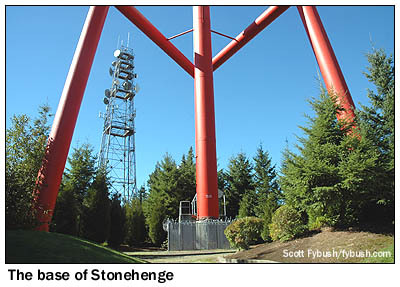 And the tower in the middle of Council Crest Park, less than a mile to the north of Stonehenge, was home in 1952 to the first commercial UHF station in America (and Portland's first TV station of any kind), KPTV (Channel 27). By the eighties, this area was a jumble of aging towers. The KPRA site had gone through several owners, briefly becoming home to another incarnation of channel 27, KHTV, in 1959 (don't worry - we'll come back to the whole KPTV/Channel 27 saga later in our Portland history, I promise! ), and then to KGMG, later KXL-FM (95.5), as well as KBOO (90.7), KGON (92.3), KPDQ-FM (93.7), KWJJ-FM (99.5) and KKRZ (100.3). 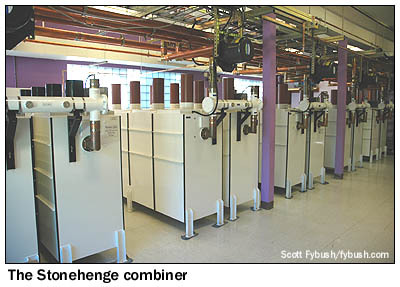 The future Stonehenge site remained home to 1410 and 97.1, by then KKSN and KKSN-FM - and all the stations up there were operating from fairly low antennas that produced lots of RF complaints from the (increasingly affluent) neighbors. Engineer Gray Frierson Haertig was the project engineer for the $9 million reconstruction job, and he created one of the classier multi-user facilities we've seen in our travels. 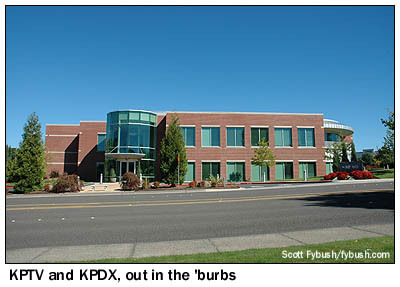 The old KPAM studio building was gutted and rebuilt with space for multiple FM tenants - and painted a nice shade of purple, too. Entering through the door on the left, there's a small office and bathroom leading to the KGON transmitter (hey, it was their site) and into the big area (on the right, as seen from the parking lot) that's home to the Shively combiner. 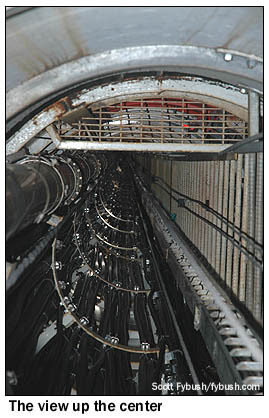 By the time the combiner's done doing its thing, there's a 9" rigid line carrying some 170 kW of RF down into the basement - and we're on our way to see where it goes, after a quick peek into those other doors off the parking lot to see the transmitters inside. KFIS (Salem's contemporary Christian "Fish") is in a little room behind the office, inside. 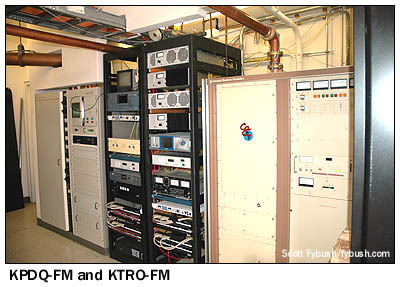 The outside rooms are home to KBOO (a nifty community radio station that was an offshoot of Seattle's legendary KRAB) and to Salem's other stations - KPDQ-FM and its newest addition, KTRO, which is the relocated and downgraded version of what was once KAST-FM (92.9) over in Astoria. 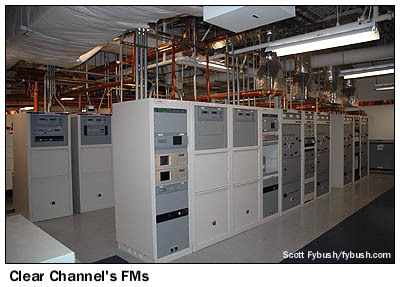 See those two little teeny Nautel transmitters at the top of the center racks, below? That's KTRO. 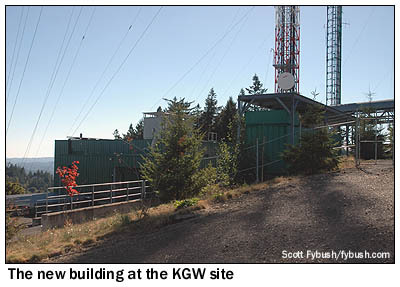 The ground slopes down sharply towards the back of the building (which has a million-dollar view over the city and out to Mount Hood), where several doors lead into basement rooms that are home to KYCH, KWJJ, a huge generator and a common room with row upon row of paging and other commercial radio services. 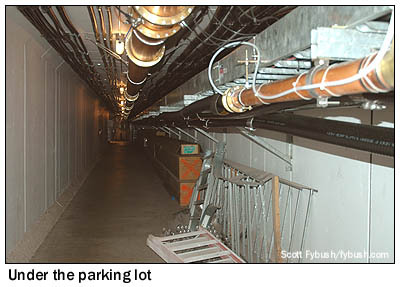 A room off that is home to KNRK - and in the back, there's a door that leads into a tunnel under the parking lot. How classy is this site? 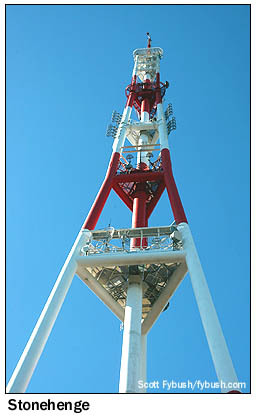 So classy that there's not an inch of exposed transmission line outside, or even visible on the tower. By the way, the outer legs of the 500-foot tower are filled with concrete up to the 400-foot level. This tower isn't going anywhere, no matter how much shaking goes on up here. 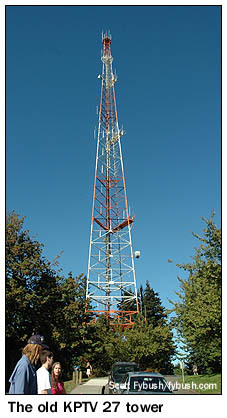 After a stop at the Council Crest Park tower, which is now used for the city's public safety communications, we move north across US 26 to Skyline Drive, home to most of the rest of Portland's FM and TV dial. 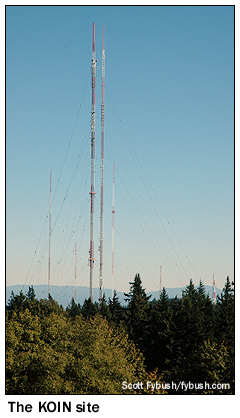 When KOIN-TV (Channel 6) came along as Portland's first VHF station in 1953, it came up here as well, building a 700-foot tower that was supplanted by a 1000-foot tower in 1963. Those towers both came down in a 1971 storm, at which point KOIN built a 222-foot temporary tower (still here as an aux), then a new 1000-footer. It was joined by another 1000-footer in 1999 for community DTV use - not only KOIN-DT (Channel 40) but also KATU-DT (Channel 43, ABC), KRCW-DT (Channel 33, CW) and TBN's - er, National Minority Television's - KNMT (Channel 24) and KNMT-DT (Channel 45). There's lots of FM up here, too - CBS Radio's KUPL (98.7), KUFO (101.1), KINK (101.9), KLTH (106.7 Lake Oswego) and KVMX (107.5 Banks), plus three noncoms, Catholic KBVM (88.3), jazz KMHD (89.1 Gresham) and classical KBPS-FM (89.9). 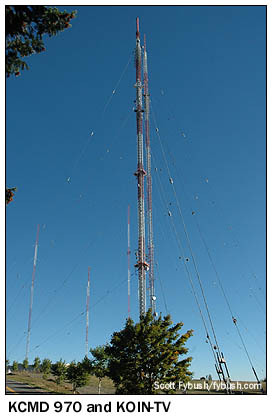 The Sylvan site was soon joined by a new cluster of towers just to the northwest. In 1956, King Broadcasting put KGW-TV (Channel 8) on the air from what's now known as the "Skyline site." 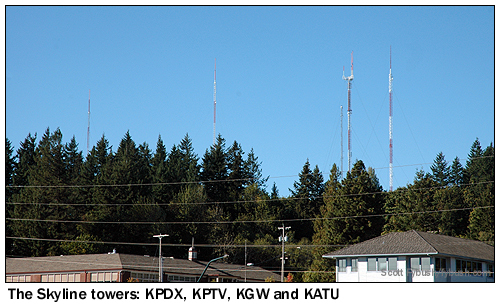 Its tower fell in the same 1962 storm that downed one of KOIN radio's towers over at Sylvan, but was soon rebuilt. That's the tower seen at right, now in a fetching shade of dark green in its new, shortened role as an auxiliary tower to the big new 925-footer that went up in 2000, as this site took on a new role as another major master-antenna facility. 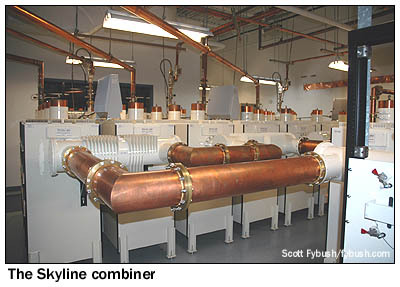 The combiner here is also a Shively, as is the 8-bay panel antenna mounted at the 720-foot level of the fat new tower, which has a three-armed platform at the top, with only two arms occupied - one by the stacked antennas for KOPB-TV/DT and the other for the stacked antennas of KGW-TV and KGW-DT (Channel 46). From here, we can see the three other tall towers in the Skyline farm: to the west, sister stations KPTV (Channel 12/DT 30) and, beyond that, KPDX (Channel 49/DT 48), and just to the southeast, the tower of ABC affiliate KATU (Channel 2). 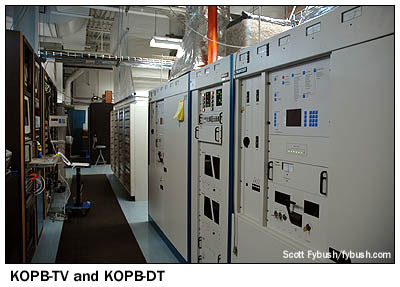 KATU's digital signal is on the air from KOIN's Sylvan Tower, and it's not clear (to us, anyway) what becomes of its analog tower after the DTV conversion in 2009. What is clear to us is that there are still plenty more Portland sites to see before our day is done. Join us right back here for our next installment, in which we see many of the studios of downtown Portland, plus some AM towers, not to mention one of America's finest independent bookstores - and visit Tophour.com beginning Wednesday, March 14 to hear the legal IDs of greater Portland! Thanks to Kent Randles for playing PDX tour guide - check out his Portland tower and transmitter photos on the SBE Chapter 142 website, too! And thanks to Craig Adams and all the folks on the pdxradio.com message boards for their help making sense of Portland's tapestry of radio and TV history!